Relying on tradition or advertising to formulate your horses ration can be misleading - the only way to be certain of what your hay or feed contains is to have it analyzed by a forage laboratory. Despite traditional thought, many grass hays are more than adequate in calcium and protein for most adult horses. Sugar and starch content can vary dramatically depending on growing and cutting conditions. Some pellets and feeds do not provide adequate levels of certain nutrients and some nutrients may be in excess of desired levels (this is especially true of iron). While most healthy horses can tolerate wide variations and imbalances, knowing what's in your feed can help provide optimum health and performance. ESC-simple sugars ($7) and Starch ($9). Also request Nitrates ($6) for breeding mares (and for sudan hay or for small grain hays grown in stressed conditions). These tests will give you Protein, DE (digestible energy/Mcal), NFC, NSC (sugar and starch), major mineral, trace minerals. The NIR test also shows fat, lignen and estimated lysine. Results are reported as "%" or "ppm" and require some math to put it into a useful format. This is the "equine" division of Dairy One. The comparable tests cost a bit more, however the report format also shows results in grams or milligrams based on the "amount fed" you indicate on the submittal form. There is a wealth of information on the website, including a "basic" version of the NRC tables. Purchase of a hay probe from Equi-Analytical includes one "free" hay analysis. No specific “submittal” form; although their website is a little difficult to navigate Litchfield was the first to provide NSC (non-structural carbohydrates: sugar and starch) testing for us and is still considered to be the “gold standard”. Should I request the NIR or Wet Chemistry Test? The "wet chemistry" tests are considered by many to be more precise, especially for sugar and starch (NSC). I would recommend using "wet chem" to test hay for insulin resistant (IR) mares in late pregnancy/lactation and horses with persistent or recurring laminitis. I have found the less expensive NIR tests results to be fairly consistent with "wet chem" test results when I have had both tests run on the same sample of Bermuda hay. The forage lab websites all have sections on taking a good hay sample. Using a hay corer will provide a more accurate representative sample for analysis. Samples should be taken from several bales (I usually sample 20+ bales in a load). The samples are mixed well in a clean bucket, then a few handfuls are placed in a "zip lock" bag – enough to fill a one-quart bag. For pellets, obtain about a cup from several bags, mix them together, then place about a cup of the mixed samples into a "zip lock" bag. The laboratories will provide mailers, but using a priority mailer (envelope or box for hay, a box for pellets) from the U.S. Post Office works well. Mark the plastic bag containing the sample with a description of the sample (such as "Brand X Pellets" or "Bermuda Hay"). Enclose a check for payment and the submittal form in an envelope with the complete Lab address on it. (Be sure you put your email address on the submittal form to get faster results via email.) Place the envelope and the sample in the mailer and send via Priority Mail. You should receive your results within one week by email. If you are comfortable with numbers, I can provide you with an Excel spreadsheet or a "paper and pencil" worksheet that you can use to calculate your supplement needs. I can also assist with in depth interpretation of the results. I use guidelines developed by Eleanor Kellon, VMD, which expand on the basic recommendations in the NRC (National Research Council) Nutritional Requirements of Horses. Current research in equine nutrition supports many changes from the last published NRC recommendations, which, in general, are "minimum requirements" rather than optimal levels. Because minerals are synergistic and many affect the absorption and utilization of other minerals and nutrients, it is important that they be balanced. 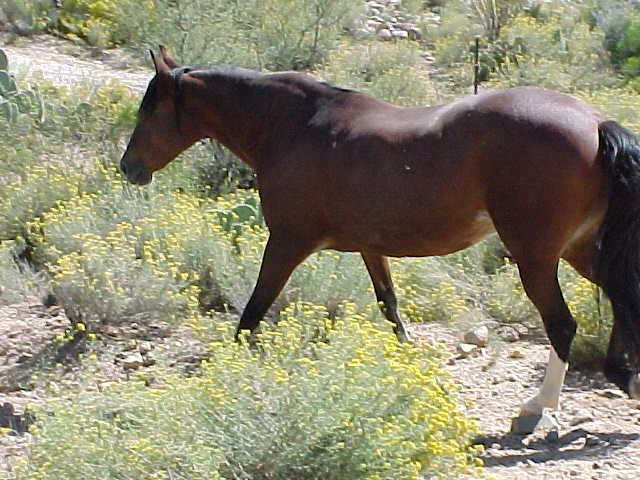 For example, most horse owners are aware that calcium should be one and a half to two times the amount of phosphorus in a horses ration; but may not know that calcium and magnesium should also be balanced. Update - higher levels of copper are more commonly seen now with the guidance of an experienced "balancer"
Update - we shoot for manganese to be 1.5 x NRC and for manganese to be at least 50% of zinc (the Cu:Mn ratio will often be lower than the previous 1:3 ratio). There are additional considerations if manganese is high, if horse is iron overloaded or if major minerals are extremely low or high. Healthy horses can tolerate fairly large deviations from these ratios but many circumstances call for staying close to ideal targets. Pregnancy, lactation and growth increase the requirements for protein – both amount and quality – and calories, and lessen the tolerance for imbalance, as do strenuous work and stressful conditions (climate, travel, environment). Metabolic conditions, age and illness also lower the tolerance for imbalance. Other factors may affect balancing a ration, including long standing excesses or deficiencies, high levels of toxic minerals (molybdenum, aluminum, etc. ), area water mineral levels, iron overload (which requires specific blood work to diagnose). These conditions may require addition of minerals beyond the normal "safe" levels, diluting the ration with forage from a different growing area or outright rejection of a forage or feed. High iron levels in hay and feed are a fairly new concern in equine nutrition for adult horses (it has been studied fairly extensively in zoo animals) and it has been shown that excessive iron can be "pro-inflammatory" in some circumstances. If your hay or feed falls outside acceptable parameters or if your horse has performance or health issues, it can be helpful to consult with an equine nutritionist. Good resources are extension services and university veterinary schools. Veterinarians who specialize in reproduction or equine sports medicine are more apt to be current in nutritional research. While many field vets rely on feed companies for nutritional education, many more are becoming involved in independently studying equine nutrition. Eleanor Kellon, VMD, is an Equine Nutrition specialist and provides ration consults for race/performance horses and breeders and also provides assistance with equine metabolic problems. Dr. Kellon's basic and advanced nutrition courses can provide you with the tools and knowledge to effectively balance your own horse's ration. Dr. Kellon can be contacted through her website at http://www.drkellon.com/. Many feed and supplement company representatives are nutritionists; however some sales representatives only have limited nutritional education. Look for one who shows how their products can meet your horse's nutritional requirements, not how they can fit your horse's requirements to their products. Because they hope you will buy their products, feed company nutritionists do not charge for services. Some of Dr. Kellon's nutrition class graduates are available for assistance on the EC Horsekeeping group at http://pets.groups.yahoo.com/group/ECHorsekeeping/. While I am not a certified nutritionist, I have studied equine nutrition for the past several years and can help you determine requirements and interpret feed analysis results. My emphasis is on education so the horse owner obtains the knowledge to make informed decisions about their horses' diet. I tend to be skeptical of "magic bullet" feeds or supplements and of those whose advice is biased by the products they are trying to sell. While many feeds, supplements and herbs are useful and helpful, I feel the horse owner is responsible to understand what they are and how and why they work. You can reach me at DesertEquineBalance@gmail.com. All feed and supplement recommendations should be reviewed with your veterinarian. This program will calculate the requirements for your horse based on age, weight, reproductive class and activity level. It is a little more precise than using the NRC tables. http://www.equi-analytical.com/default.htm under the "Putting results to work" tab. http://horsebooksetc.com/products/Horse_Journal_Guide_to_Equine_Supplements_and_Nutraceuticals-879-0.html is an up to date comprehensive review of supplements and their uses. Equine Supplementsand Nutraceuticals by Eleanor M. Kellon, VMD, (no longer in print but you might get lucky) is available from Breakthrough Publications, www.booksonhorses.com (and other sources such as Amazon) and contains excellent discussion on general and specific needs as well as information and maps concerning toxicity. Dr. Kellon's Equine Nutrition Courses (basic through advanced) are available at http://www.drkellon.com/. Equine Cushings Group – Equine Cushings and Insulin Resistance discussion, research and support moderated by Dr. Eleanor Kellon with reams of nutritional information. EC/IRHorse.com is a sister web site to the Equine Cushings group. Susan Evans Garlinghouse, DVM's website contains "must read" articles on nutrition for endurance horses. I lost my first Peruvian mare, Perla de Oro, because of poor nutrition. What I didn't know at the time was that she most likely was insulin resistant (IR). Perla was pregnant with twins (the last sonogram showed only one) which she lost at eight months; one was mummified and likely had been dead for a while. The placenta was retained and, despite the best efforts of my veterinarian, she foundered. Perla had the "typical" signs of IR — overweight with patchy fat, cresty neck, dropped topline, hungry and thirsty all the time. The usual way of dealing with the overweight horse at that time was to restrict intake — so she was put on two light flakes of Bermuda hay with a little senior feed to provide some minerals and vitamins. While her founder improved (with the help of a natural trimmer and custom Horse Sneakers), she did not lose her fat or cresty neck. But her immune system became severely depleted and was overwhelmed by a salmonella infection. Though she tried to fight it up to the last minute, Perla died a terrible painful death. Since that day I have been plagued with "what ifs" and guilt. When my Peruvian filly, La Perricholi, began to show a cresty neck and excess fat on a conservative diet of Bermuda hay and small amounts of Strategy, I started to explore the web. When Perla foundered in 1996, I had found Gretchen Fatenhauer's website which has since evolved and expanded. Gretchen was one of the pioneers of the "barefoot horse movement" and became a supporter of Hildebrand Strasser. While many consider Dr. Strasser's techniques controversial, all barefoot horses and their owners owe her and Gretchen a debt in reintroducing us to a more natural lifestyle for our horses. From there, I came across the Equine Cushings group on Yahoo — created by Robin Siskel and moderated by Eleanor Kellon, VMD. When I joined the group in September 2000, there were some 300 plus members, by November of 2003, there were over 1,000 group members — there are now over 4,000! It was here I learned about hay analysis, mineral balancing, the NRC (National Research Council Nutrient Requirements of Horses), low NSC hay (Non-Structural Carbohydrates or sugar/starch) and how they all come together to affect our horses. As I began to understand what horses need nutritionally, I developed spread sheets to calculate all the math, shared them with other list members, and tried to help those who were "math challenged". Since then, most of my free time has been devoted to studying and learning about equine nutrition — expanding from the IR and Cushing's horse to helping horse owners in the Southwest develop better rations for their foals and performance horses. At my trimmer's request, I made a regional supplement I had formulated for my own horses available to her clients and have had the satisfaction of seeing many horses develop the good feet, shiny coat and improved attitude that reflects good health. This has evolved into Desert Equine Balance — which I hesitate to call a "business" as I haven't really figured out how to make money at it. While I do charge for consults, the greatest satisfaction is in seeing healthy foals, horses becoming fit and athletic and laminitic horses getting a new lease on life — along with their owners gaining a new understanding of equine nutrition. My path to learning and what I may accomplish for these horses is thanks to the generous sharing of her knowledge and experience by Eleanor Kellon, VMD.